Belated Happy Roy Orbison Day. 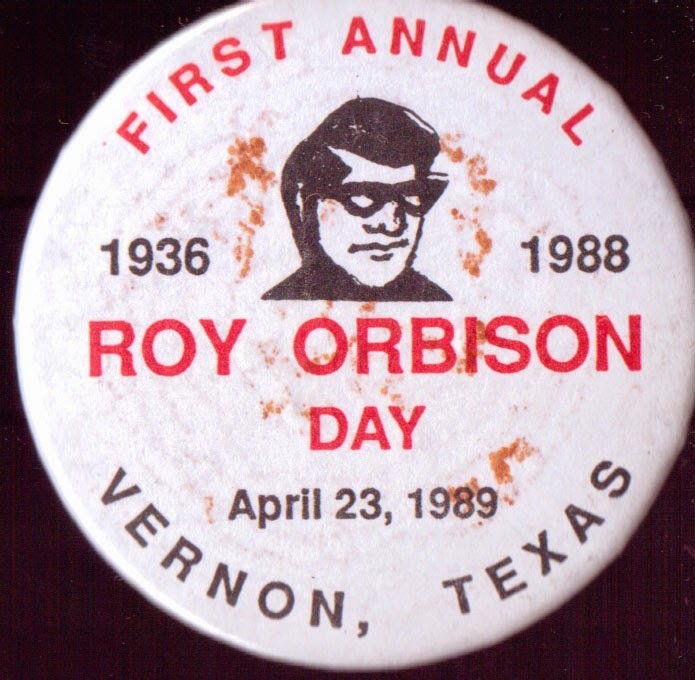 On the 23rd of April each year, the people of Vernon, Texas celebrate Roy Orbison Day. Or at least, I assume they do. They certainly did back in 1989 when my badge was manufactured, and I see no reason why they should have stopped in the interim. I know I am exactly one week late in drawing your attention to Roy Orbison Day, and as such I apologise as usual for my recent tardiness in trying to uphold my self-imposed one-post-per-week schedule. Same reason as ever - I've been busy. However, this time I'm happy to report that I've at least been busy with something tangible... and as a result, I'm unlikely to forget Roy Orbison Day quite so easily in future. 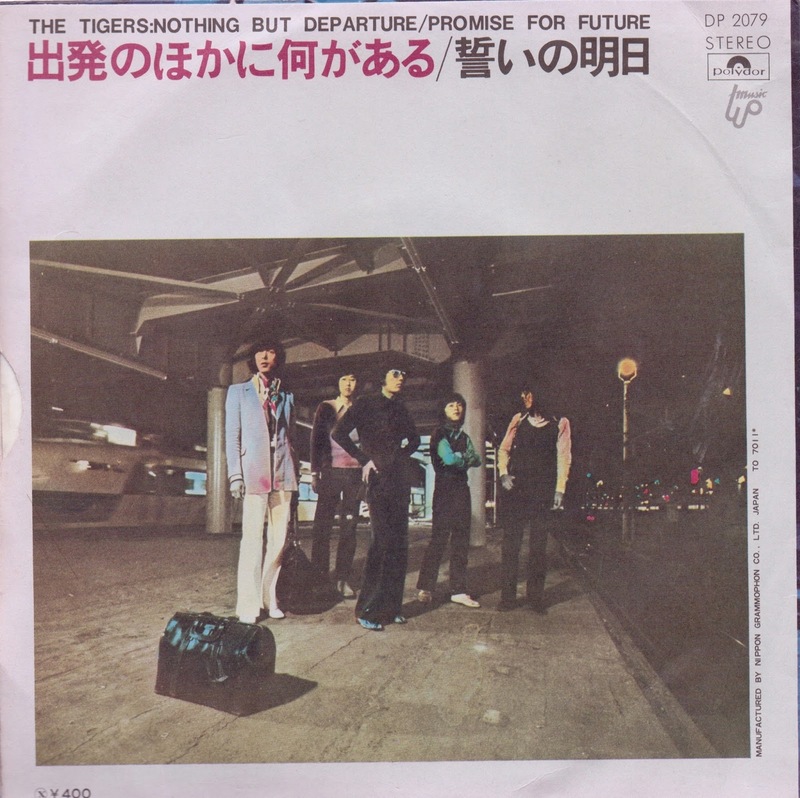 Probably the most successful band to emerge from Japan’s '60s ‘group sounds’ industry, The Tigers are a fairly central presence in the country’s rock/pop landscape, with members Kenji Sawada, Osami Kishibe and Shiro Kishibe all remaining in the public eye via solo records, tabloid gossip and film & TV appearances. In fact, lead vocalist Sawada (who often performed under the nickname “Julie”, a moniker he apparently earned through his admiration for Julie Andrews!) actually went on to totally eclipse the success of his previous band, becoming one of the most ubiquitous solo stars of the ‘70s, his handsome features still looming large over the racks of many of Tokyo’s record shops. Even as his record sales eventually began to wane, Sawada continued to make good as an actor, putting in an excellent against-type lead performance in the Leonard Schrader-scripted film ‘The Man Who Stole The Sun’ in 1979, amongst many other thespian achievements. Returning to The Tigers though, it doesn’t exactly take long figure where the group’s main inspiration lay. Unsurprisingly, it’s Beatles, Beatles, Beatles all the way. And so, with their idols taking the decision to pack it in in 1970, it is perhaps less than a coincidence that The Tigers decided to follow suit. 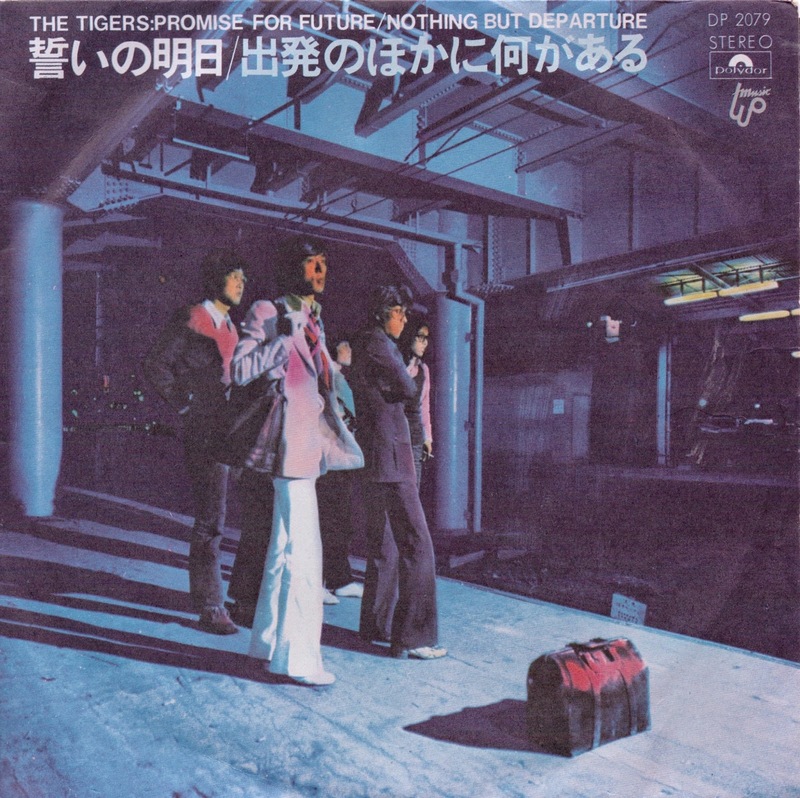 Insofar as I can tell from English language googling, the double A-side ‘Promise for Future’ / ‘Nothing But Departure’ was the band’s last single, appearing in November 1970, with both song titles and cover-art clearly signalling their intention to end their career in style. A month later, both cuts were included on their final studio LP, the pleasantly titled ‘Freedom, Hope and Friendship’, and after a posthumous live album (‘Finale’) in ‘71, that was all she wrote for The Tigers. Moving beyond the Beatles influence, ‘Promise for Future’ is a lovely bit of energetic, up-with-people flower-pop, complete with flute, harp, horns, strings, ethereal vocal harmonies, bongos – everything but the kitchen sink really - but it never sounds over-busy, and is kept grounded throughout by a swinging, r’n’b backbeat and tough acoustic strumming. Sounding only marginally like the Beatles, it’s a lovely bit of breezy summer-time fun, a perfect accompaniment for smokin’ it up in the park, dancing barefoot round some beach bonfire as the sun sets - who knows, maybe even a ride in the ol’ dune buggy? – and is easily a match for the numerous American groups who were peddling this sorta chart-orientated hippy-dippy business a year or two earlier. I would definitely be liable to DJ this if I were ever, say, playing records between bands at an outdoor festival or something. Over on the flip, ‘Nothing But Departure’ also presents a slightly more interesting take on things that the band’s earlier, more overtly imitative work. Sure, the swoonsome, piano chord bashing melody on the song’s verses may scream McCARTNEY in block capitals, perhaps marking this out as The Tigers’ answer to ‘Let It Be’, and the closing (and thankfully rather brief) ‘da da, da da da’ coda seems like a pretty cynical attempt to pull a ‘Hey Jude’, but somehow these rips are neither as obnoxious nor as obvious as they sound on paper and, coupled with a few interesting production decisions and distinctly Japanese additions to the formula, the tune eventually makes for a quite likeable slice of international Beatle-sploitation. For one thing, the song begins with a lengthy and dramatic spoken word recitation that I can only assume concerns the band’s decision to split up (my sub-rudimentary Japanese gives me a few words such as ‘why?’, ‘friends’, ‘alright’ etc. ), whilst the chorus melody takes off in a distinctly non-Western, melancholic sort of direction, and, as with the a-side, the backing track’s emphasis on overlapping percussion and choppy strumming gives things a *slight* Hispanic / Tropicalia sort of feel that also muddies up the Beatles influence a bit. Whilst I’d be unlikely to ever DJ this side of the single anywhere, I don’t dislike it, and it’s nice to imagine the band’s legions of fans sticking this one on the turntable back in November 1970, weeping a quiet tear at this positively-minded farewell from their heroes.